Chai in Hindi चाय chāy means tea. 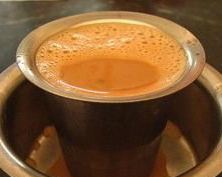 It is a hot beverage from the Indian subcontinent. 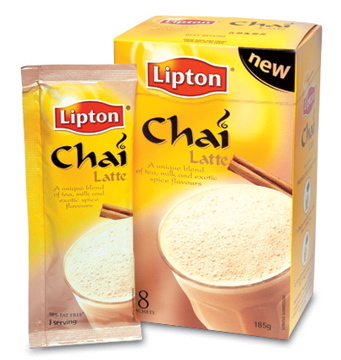 Chai is a generic word for tea in India and Asia. However, the word Chai in the West is misconstrued as Masala Chai. The correct usage would be to omit the redundancy for just Masala Chai or just Masala tea. The traditional chai brewing process in India is to actively boil the tea leaves over sustained heat. Preparing tea with this method reduces the amount of caffeine and also the prolonged boiling produces a more robust tasting beverage. Chai is simply prepared black, with milk, without sugar or spices. Masala chai is a spiced milk tea and is distinct from other types of tea. Masala chai is prepared through a decoction. 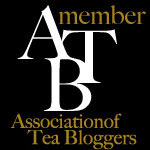 Loose tea leaves are simmered or boiled in a mixture of milk and water. Sweeteners - sugar or Jaggery and whole spices like cinnamon, cardamom, cloves or black pepper are added to create a unique and distinctive flavor. Chai masala in Hindi चाय मसाला.